His debut will on on a triple header on Sunday. We're at home but Streatham and Croydon RFC (Icons passim) along with the Old Alleynians are coming to Poplar Road, and the teams will all play each other in a sort of mini festival. The Old Alleynians were founded in 1898 by and for former pupils of Dulwich College so PG Wodehouse will be cheering them on from heaven. A £3.7m investment will drive the planned transformation of Colliers Wood. Earlier this month the Wimbledon Guardian revealed Merton Council’s plan to create a new high street in Christchurch Road. Now the Mayor of London has announced the amount Merton Council will receive for projects in the area. A grant of £715,000 for Mitcham town centre has also been announced, which should spark further council investment. The authority said the Colliers Wood cash would be used to create a new “town square area” near the Brown and Root tower, which is set for redevelopment. Shops will also receive a facelift and new street furniture will be installed. A Merton Council spokesman said the cash would also benefit South Wimbledon and create a new “boulevard” with footpaths and cycle lanes in Merantun Way. The cash has come from a Greater London Authority (GLA) regeneration fund for areas affected by last year’s rioting. Myself: A man who frequents the boulevards; thus, a man about town or bon vivant such as my good self. Prodnose: Don't give me that load of old flannel. Ever wondered what Skinny O'Bri was doing in 1989 and 1990? Hop over to http://bernwanderingyears.blogspot.com/ and wonder no more. Prodnose Thank you; I've worked hard to become so. Myself: I admit it, you are better than I am. Prodnose Then why are you smiling? Myself: Because I know something you don't know. Prodnose And what is that? Myself: I... am not left-handed. Myself: I ought to be, after 20 years. Prodnose Oh, there's something I ought to tell you. Prodnose I'm not left-handed either. What with one thing and another I forgot to remind you that St Dwynwen's day was celebrated in Wales on 25 January and commemorates the patron saint of friendship and love. Dwynwen lived during the 5th century and was, by all accounts, one of the prettiest of Brychan Brycheiniog's 24 daughters. The story goes that Dwynwen fell in love with Maelon Dafodrill, but unfortunately her father had already arranged that she should marry someone else. Maelon was so outraged that he raped Dwynwen and left her. God then gave three wishes to Dwynwen. First she wished that Maelon be thawed, second that God meet the hopes and dreams of true lovers and third that she should never marry. All three were fulfilled, and as a mark of her thanks, Dwynwen devoted herself to God's service for the rest of her life. Motto: If it smells like a Maelon, looks like a Maelon and tastes like a Maelon: it's a Maelon! What a country. The Daily Mail, an omniverous middle-market British tabloid, has quietly unseated the New York Times to become the newspaper with the biggest online reach in the world, according to figures from the online tracking service comScore. The figures show Mail Online reached 45.3 million people last December, to the Times's 44.8 million. Trailing them are USA Today at , the Tribune newspapers , and the Guardian. The growth, the editor and publisher of the Mail's online properties, Martin Clarke, said, has been driven by U.S. traffic. You should all be ashamed of yourselves, http://www.dailymail.co.uk/ is an avalanche of inanity and cruelty pouring relentlessly into a witless design. THE ‘Nearly Men’ are really there. For all the mind games in the build-up to this dramatic semi-final, it is Cardiff City who will be at Wembley for the Carling Cup final. Because for all the suggestions from Palace boss Dougie Freedman that the Bluebirds are perpetual bridesmaids, at least Malky Mackay’s men have been invited to the ceremony after an incredible penalty shoot-out victory. It is the Cardiff fans who will have the big day out underneath the arch, their fourth in four years – more than either Manchester City or Liverpool who play tonight for the right to face the Bluebirds. It wasn't officially eat you way around the world in London, but I went to my first Goan restaurant in Charlotte Street over the weekend. After perusing Goan Cuisine and Goan Catholic Cuisine in wikipedia (fascinating stuff by the way) I had a Pork Mas. While we are on the subject of food, I was looking at haggis last night, thinking of introducing the Bomber to it for Burns' Night tomorrow. You have to cook it for an hour and a half though, and that is not really a practical proposition for when we get in after athletics, so he has escaped for this year. As the celebrations of the year of the dragon sweep across Asia, it has struck me that the Bomber, who was born in 2000, is a little dragon (龍 Lóng) as well. 鼠 Shǔ Rat, 牛 Niú Ox, 虎 Hǔ Tiger, 兔 Tù Rabbit, 蛇 Shé Snake, 馬 Mǎ Horse, 羊 Yáng Goat, 猴 Hóu Monkey, 雞 Jī Rooster, 狗 Gǒu Dog and 豬 Zhū Pig. He has got off comparatively lightly. I wonder what I am? I went to see Royal Manuscripts: The Genius of Illumination in the British Library yesterday. I bought a fridge magnet as a souvenir. Facebook users can comment on the books in the Royal Manuscripts exhibition, by viewing our seven specially created albums. That is an intriguing initiative. After the Muppets, I think we should have a Klaus Nomi revival. Thus I am late addressing the nation this morning. This may be a blessing in disguise as I have nothing to say. As Kelly Clarkson's latest magnum opus "What Doesn't Kill You (Stronger)" came on the radio yesterday I found myself wondering how Friedrich Nietzsche's "what does not kill me, makes me stronger" from Twilight of the Idols, which is close to 125 years old, casts such a spell on the purveyors of popular music. See Icons passim and the following video. I went to see The Artist in the HMV Curzon last night. It is great. Feel free to think of me sitting in a silent film as a SOPA protest; a bit like the Wikipedia blackout. 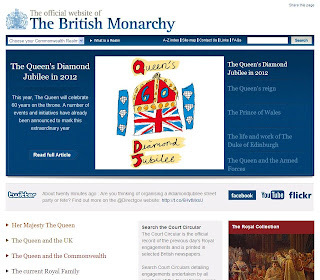 Nothing major, but www.royal.gov.uk got a wash and brush up yesterday. The Bomber and I came across New Girl while innocently testing the 4OD app on the XBOX this weekend, and both rather fell for Zooey Deschanel's scatterbrained protagonist. What can I tell you? We had to download Fast Five on Zune just to restore the testosterone level. Prodnose (sings): Soon you'll grow, so take a chance with a couple of kooks hung up on romancing. Today I have to get up at the crack of dawn to get the gym out of the way out of the way before I take the Bomber and his mate to play an away fixture at Old Whitgiftians. Straight after that - with nary a moment for a shower - we are off mob handed with other chums to see Dame Edna in panto at Wimbledon Theatre. This will immediately be followed by food and drink at Jimmy Spices which will mean I will have to leave the car. Tomorrow I will have to get up at the crack of dawn to go and get the car so that I can take the Bomber to school. I have long suspected that Slavoj Žižek hadn't got the faintest idea what he was talking about. Up until now it has been an itch I couldn't scratch, but in the first two paragraphs (above) in this piece from the London Review of Books he is training the laser beam of his intelligence on a topic I've actually thought about quite a lot. I can't be bothered to go through the category errors that pile up once software is equated with a reified general intellect. The most telling thing however, is he throws us this bone as Microsoft's hegemony is on its last legs, even if his analysis was correct (which it isn't) it's out of date so its conclusions would have nothing to offer anyway. Prodnose: Adrian Johnston's book Zizek's Ontology: A Transcendental Materialist Theory of Subjectivity argues against the position that Žižek's thought has no consistency or underlying project. Prodnose: Beneath "what could be called 'the cultural studies Žižek'" is a singular "philosophical trajectory that runs like a continuous, bisecting diagonal line through the entire span of his writing (i.e. the retroactive Lacanian reconstruction of the chain Kant-Schelling-Hegel). Prodnose: Žižek's work is better described as rigorous in the sense of systematic rather than as comprising a single, all-encompassing "system." Myself: Garbage In, Garbage Out. The Gauntanomo Bay detention camp is ten years old. It was set up after the US Department of Justice advised that it could be considered outside U.S. legal jurisdiction, with the further assertion that detainees were not entitled to any of the protections of the Geneva Conventions. The parallel with the misuse of offshore bank accounts for tax evasion and money laundering is quite striking. I can't help but note that persons subject to US income tax are required to declare any offshore bank accounts on penalty of perjury. Is tax evasion by a US citizen worse than law evasion by the US government? Is money laundering worse than laundering people by extraordinary rendition? I think the whole thing is a disgrace and corrodes any notion of US moral authority. Col. Jessep: You can't handle the truth! .... and so it goes. "There is nothing like a Dame who drags herself from the docklands of Cardiff, to don diamond-studded wellington boots at Glastonbury seven decades later," says the BBC. Dame Shirley Bassey talking candidly about growing up in a mixed-race family in impoverished wartime Tiger Bay has got to be worth a listen. If Milt Romney wins in New Hampshire, how much of it will be down to his Mrs' recipe for Welsh cakes? Mobile operator O2 is to provide free internet to "millions" of residents and visitors in central London by launching Europe's largest free wi-fi zone. The service will be rolled out across the boroughs of Westminster and Kensington and Chelsea in 2012. And so it came to pass that free internet access arrived in the two London Boroughs where everyone could already afford it. Over to you Martha. Although I don't really follow football with great enthusiasm, I have always had a place in my heart for Manchester United. I've no clear idea why this should be so. So now I've recovered from United's pulsating 3-2 win against Manchester City today, I have to come to terms with the discovery that Ben, while officially disengaged from football as a rugby man, was supporting the Blues. Tooting judo star Winston Gordon hopes the spirit of 2002 can help him conquer the world in 2012. The 35-year-old middleweight judoka was last week named in the Team GB squad for next year’s London Games, despite missing the recent test event at London’s ExCel Centre at the weekend through injury. The two-time Olympian, who will now make his third successive Olympic appearance next summer, won Commonwealth Games gold when the event was hosted in Manchester nearly 10 years ago. See Icons Passim. The Bomber's given up judo for rugby and athletics now. I wonder if he realizes what a privilege it was to train with Winston, and simply to watch him come from hospital and crutches in 2009 to Olympic rehabilitation in 2012? Here are the Bomber (second from right back row) and his team at their Twickenham appearance (see Icons passim). We're off to the Stoop next week for the Quins' Curtain Raiser Cup. There is no broadband back at Mum and Dad's in Cardiff, though there is a fully loaded Sky subscription. The Burglar has pointed out that this account could fuel Sky Go on two devices at no extra charge. Enjoy up to 32 live channels including thousands of hours of on demand entertainment online for free in line with your Sky TV subscription. Maybe I could put it on the Bomber's XBOX? Myself: Did you miss me? Myself: While I was away? Did you hang my picture on your wall? Did you kiss me? Myself: Every single day? Although you couldn't kiss me at all? And did you love me? Myself: Odd that. I hardly thought of you.